“Climate Change is happening.” You bet it is. The climate of planet Earth has been constantly changing for as long as we have any records. Look at the chart below. This chart of data obtained from Ice Cores collected near the South Pole displays the longest known record of the climate of Earth. It goes back 400,000 years. Just look as the constant changes in temperature and atmospheric Carbon Dioxide. The changes range from very large to rather small. The four big dips are Ice Ages and the four big peaks are what we know as Interglacial Periods. The ice ages are very hostile to human life. It is during the warm periods that life flourishes. We are very lucky to be living our lives during one of the warmer periods of Earth’s history. Clearly the civilized activities of mankind including the burning of fossil fuels had nothing to do with these historic changes, large and small. After all, our modern times are covered by only the last little squiggle on the right hand side of the chart. 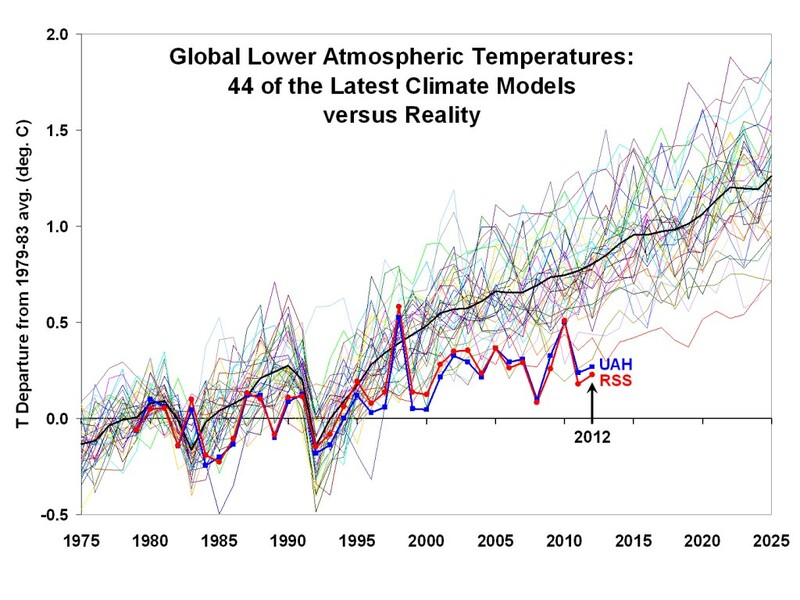 Can you look at this chart and identify Earth’s normal climate? Certainly we can compute the average, but is average the same as normal? I don’t think so. 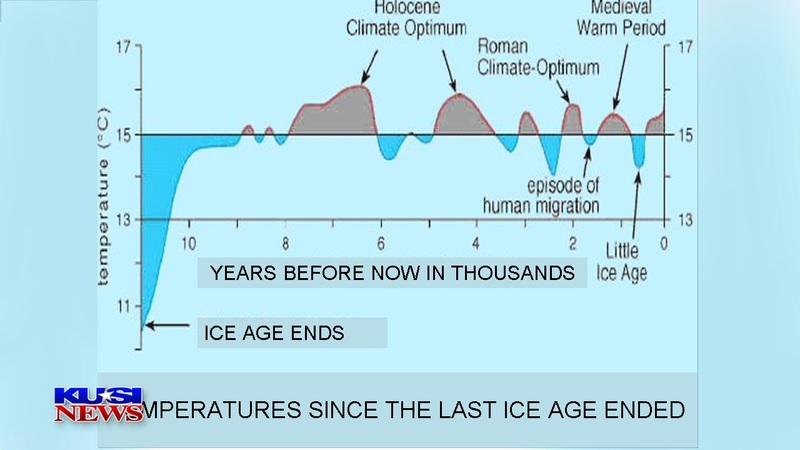 Now let’s look at a chart of the last 11,000 years since the last Ice Age ended and we moved into this Interglacial Period. This is the period in which civilization has developed and flourished. The most difficult time was the little Ice Age from about 1550 to about 1800. Look at the tiny, little warm period on the extreme right hand side of the chart. It is during this period that our civilization began to make extensive use of fossil fuels for heating, cooling, electrical generation and to power internal combustion and eventually jet engines. Please note that this current warm spell looks no different than the others during the last 11,000 years. Now let’s look at a chart of the last 1,000 years. The Medieval Optimum was the period in which the nations of Europe grew and prospered and many of the great European cities were founded and flourished. It is important to note that it was much warmer back then than it is now. There is nothing exceptional about the current warm period. Note that changes such as the Medieval Warm Spell and the Little Ice Age come fairly often and still smaller swings in climate are constantly occurring. Now a chart of the modern times. 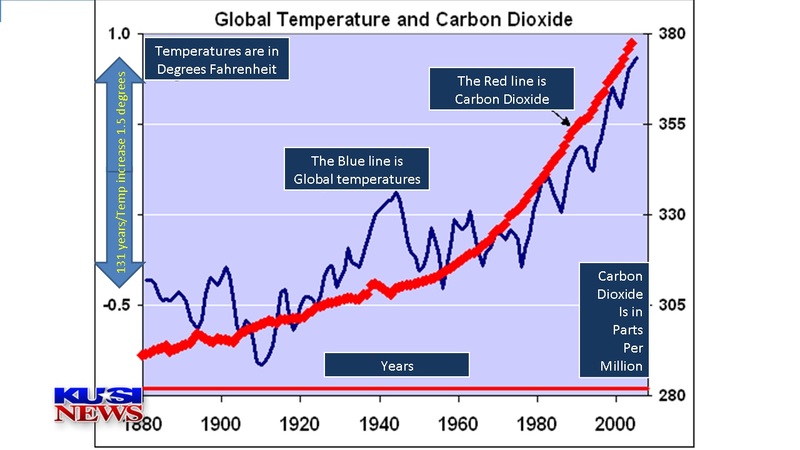 This chart is used these days by climate alarmist to show the warming and increase in carbon dioxide in the age of fossil fuels. When you haven’t seen the previous charts, this one looks rather ominous. However, when it is put in perspective by the previous charts, it does not constitute a dramatic departure from the natural pattern at all. And, when it is carefully examined, it is far short of alarming. First of all, the warming from 1880 to today is less than 1.5 degrees, hardly dramatic and very much in keeping with the gradual warming pattern since the end of the last Ice Age. Secondly, despite a continuous increase in the carbon dioxide, there was actually a forty year period of steady temperatures from 1940 to 1980. And the chart ends the same year the rise ends. Now look at the chart of the last twenty years. This chart clearly shows the disconnection between temperatures and atmospheric carbon dioxide (CO2) since 1996. 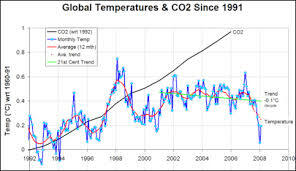 The temperatures stopped warming but the CO2 continues to rise. This lack of correlation between carbon dioxide and temperature is very significant. That’s because the entire global warming/climate change alarmist case is based on the theory that CO2 is a powerful greenhouse gas and will drive temperatures dramatically warmer. Let me emphasize this because it is the failed theory that is the basis of the entire global warming/climate change scare campaign. The alarmists say an increase in CO2 will cause a huge spike in temperatures and that will lead to all the other dire consequences they predict. Over the last thirty years, dozens of climate scientists have worked at refining this CO2 greenhouse gas theory and have created climate models in computers to predict the rise in temperatures. They structured the models to match the previous temperature pattern starting back about 1975. But as time passed, and the models’ moved from the past to the future, the forecasts don’t go well, to put it mildly. Over time a significant disconnect between actual temperatures and the predictions develops. Couple the disconnection in the models’ predictions and the failure of the actual temperatures to react to a continuing CO2 build-up and you must conclude the CO2 greenhouse theory is not valid. It is a totally failed theory. And it seems to me that ought to be the end of the climate change alarmism campaign. But, alas it rolls on non-stop. Why is that? Three reasons stand out: Stubbornness, politics and money. It’s never easy to admit you are wrong. Your personal pride, how you are regarded by friends, colleagues and family and the setback in your professional status all contribute to stubbornness. In climate science, a scientist who admits his theory is wrong faces loose of funding, position and a professional future. It seems to me that at this point, dozens of climate scientists are just too stubborn to admit the CO2 greenhouse gas global warming theory has failed. As for the political reason, it showed up dramatically in the New York Times exit poll following the November 2014 election. My investigative Journalism uncovered the details of how global warming became a political issue. Here is that story. A great scientist named Roger Revelle theorized about carbon dioxide being a significant greenhouse gas in a 1957 research paper. He then lectured about this paper to his class at Harvard University in 1962. A student in that class named Al Gore adopted the theory as his “cause”. He wrote a book about it and used it to win an election to become a United States Senator from Tennessee. In the Senate he helped to establish Federal Government funding for global warming research grants. 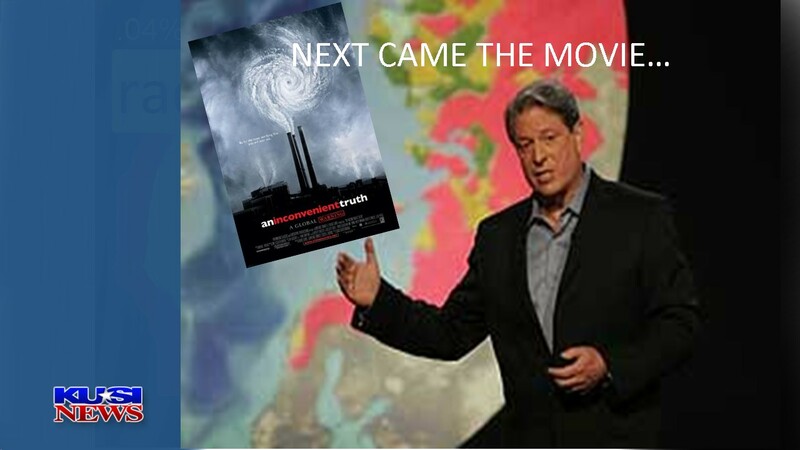 Gore wrote a second book on the topic “An Inconvenient Truth” and worked with Hollywood supporters to turn that book into a movie. The movie won an Oscar. The books, funding and movie caught the attention of a bureaucrat at the United Nations. That bureaucrat, named Maurice Strong, set out then to establish the Intergovernmental Panel on Climate Change. As a result the number of research papers on global warming multiplied. News releases about the papers resulted in the media producing a continuing string of news reports about “the sky is falling” and global warming became a “cause celeb”. 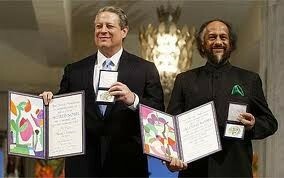 It all peaked when Mr. Gore and the UNIPCC were jointly awarded the Nobel Peace prize. The U.N. continues to hold conferences and publish reports and the Democrat Party has adopted global warming as a platform issue. The science has been totally overwhelmed by politics and become a political issue. 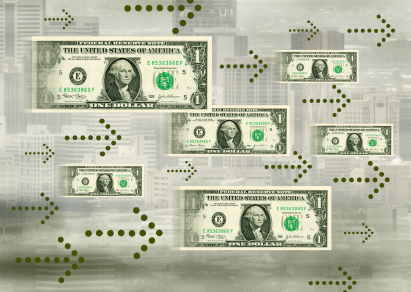 Now, consider the biggest driving force of all behind the global warming/climate change frenzy: money. Never underestimate the power of money. The research funding for global warming from the United States Federal Government has built-up through the years. It is now nearly 5 billion dollars ($5,000,000,000) a year. If you are a research scientist or manage a research institution/ organization or a department in a University or even if you manage an activist environmental group, you want and need some of that money to fund your career. The funds are only being granted to those who support the climate change theory. As a result global warming alarmism has become a well-funded industry. Not only are our tax dollars funding a mountain of research papers, but now the government funding to “solve” the climate crisis has spread out and now flows in many directions. There is funding for Ethanol gasoline and greatly increased corn production. And, there are tax breaks for solar and wind projects. And there are direct government subsidies and grants to pay for a multitude of projects to counteract the threat of CO2 induced warming. At this point all of those expenditure add up to an amazing 16 billion dollars ($16,000,000,000) a year of tax money. So while the science behind the climate change has failed, the government actions to counter it continue to grow. It seems to me that while they have all been benefiting in many ways from the climate change frenzy, scientists, the media, environmentalists, bureaucrats and politicians have all been thinking about climate in a wrong way. They seem to have been thinking that there is a normal climate and it is what the climate was when mankind began to use fossil fuels. They have been positioning the climate debate to tell us that it is our responsibility to return the climate to be exactly as it was then. But the climate at that point in history was no more stable or noteworthy or desirable than it was before or since. It seems to me that there is no such thing as the normal climate. There is no normal extent of ice at the poles. There is no normal amount ice in the mountain glaciers. There is no normal sea level height. There is no normal number of tornadoes or hurricanes. Droughts, heat waves, cold snaps, blizzards and ice storms increase and decrease irregularly over time. I feel it is wrong to set the parameters of the “normal climate”. It may blow your mind to learn that the National Oceanographic and Atmospheric Agency and its National Weather Service simply use the average of the last 30 years as “normal” climate. So what is being touted as normal climate now is no more than what it has been lately. Urban Heat Islands: The heat released into the atmosphere by the cluster of concrete, asphalt and steel and thousands of heat emitting smokestacks and the clustering of hundreds of thousands or even millions of warm human beings does produce very significant localized warming of the atmosphere. This is particularly obvious in major northern cities on winter nights. In Chicago, for example, the low temperatures on a winter night might range from 32 degrees in the heart of the city to 20 in the suburbs and 10 in the surrounding farm country. 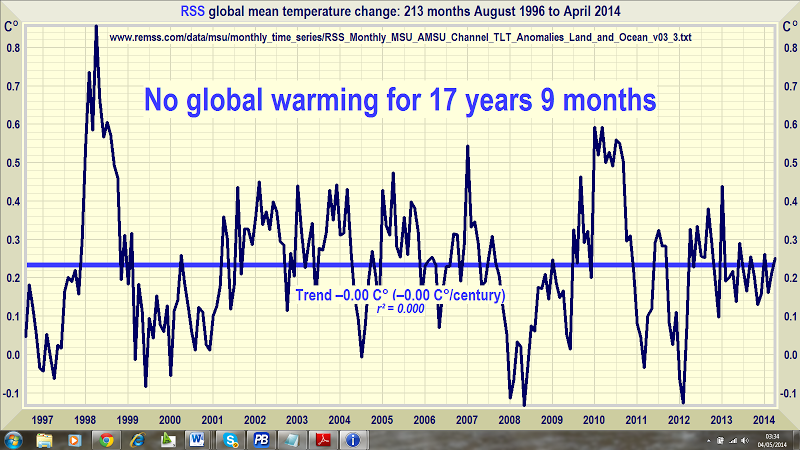 That warming is localized, mostly seasonable and not a threat in any way to climate of Earth. It is not a result of the CO2 in the air and will not be counteracted by carbon taxes or abatement. Similarly there is increased humidity in irrigated areas cities where we import water and drier climate in the regions from which we are exporting the water to cities. These effects are real and measureable, but are not a threat to the climate of Earth and are in no way related to the increase in CO2 in the atmosphere from the burning of fossil fuels. 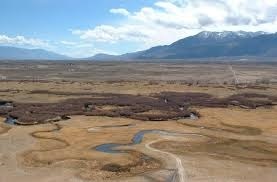 The Owens Valley in California, pictured above, is a prime example of this category of man-made climate change. It once was a beautiful and bountiful green farming valley fed by a river of water that flowed off of the Sierra Nevada Mountains to the west. But the city of Los Angles bought out the valley and exported all that water the nation’s second largest city. This is of no global significance and definitely unrelated to the burning of fossil fuels and the release of carbon dioxide into the atmosphere. And here is one more man-made climate change: high cloudiness has increased significantly in the regions where there is an exceptional number of high flying jet aircraft on a continuous basis. Of all the man-made climate changes this may be the most significant. It is only recently been statistically proven. It is somewhat regional in the plains states of the United States centered on Kansas. The constant and increasing stream of high flying cross continental jet aircraft flights is filling the sky with contrails. This pattern of high clouds is cooling temperatures a degree or two on average and probably reducing the number of showers and thunderstorms in the region. All of this may have some impact on crop yields in the region. This is not a global weather crisis, not by a long shot. It may not be a big deal. But more study is merited. And it is definitely not related to the burning of fossil fuels. 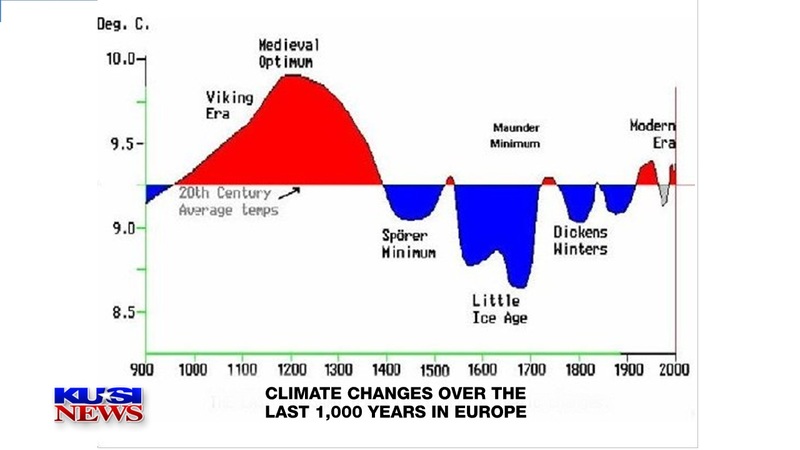 These and other minor climate changes resulting from mankind’s activities are well documented. However, none of these problems is devastating or a crisis. We are dealing with them and there is no need to become alarmed about them. There is another aspect to the debate today. Al Gore lectures about how we human being are “spewing tons and tons of carbon into the atmosphere every day”. This is a totally irresponsible alarmist rant. In the United States we have utilized advanced science to refine our coal, oil and gas and the systems that burn it. Our power plants, cars and aircraft produce a very limited amount of carbon particulates and ash. What is produced is a tiny amount compared to smog our furnaces powered by coal stokers and our old fashioned auto engines and primitive gasoline produced in the 1930’s and 40’s. And what reaches the air at this time, quickly falls to the ground. Unfortunately, this is not true in China, India and elsewhere in the third world, where the advanced technology is ignored in the rush to produce desperately needed electricity and transportation. However, on a worldwide basis, they are not producing a climate crisis. What Al Gore is talking and greatly distorting in his holier-than-thou screaming is not carbon, even though that is the way he terms it to spread his alarmism. What he is talking about is Carbon Dioxide. 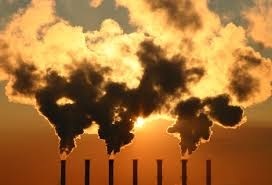 Well is true that our burning of fossil fuels is sending millions of tons of carbon dioxide into the air. But is not causing any problem at all and it fact is creating a great deal of good. But Gore’s pontification is usually accompanied by a picture of a smoke stack belching heavy, dark smoke into the sky. That is not carbon dioxide you see rising from those smoke stacks. 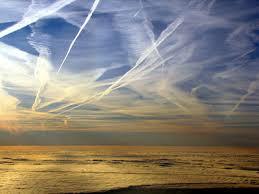 It is largely harmless water vapor. There are probably some tiny particles of carbon in the plume. They will settle to the surface shortly or become the nucleus of rain drops. There may be some ash in the smoke. It, too, is essentially harmless. Mostly when you see a picture of dark smoke rising from a smoke stack these days it is because the Sun is on the other side of the plume of water vapor and it is creating a dark shadow. With today’s clean fuels and smoke scrubbers in the smoke stacks, very little pollution is being emitted. And our car engines today are very different than the smog belching crude devises of the 1940s. In our cars, we have replaced carburetors and spark plugs and added catalytic converters and reformulated the gasoline and now very little comes out of the exhaust pipe but some CO2 and water vapor. Further discussion of this issue must begin with a definition of carbon dioxide. It is invisible. It is odorless. It is tasteless. And CO2 is essential for life on Earth, since all plant life requires CO2 for photosynthesis, the process by which it lives and grows. No CO2 would mean the planet would be barren and brown. So all animal life would perish of starvation and so would we human beings. Carbon Dioxide has always existed naturally in the atmosphere. So I don’t see any reasonable way to conclude that carbon dioxide which is essential for life and not producing climate change, is a pollutant. It simply is not a significant “greenhouse gas”. 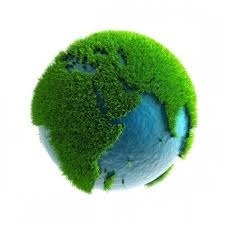 In fact, the increase in CO2 in the atmosphere has essentially produced a fertilizing effect on all flora on the Earth. Our planet is 20% greener than before we burned fossil fuels. Crops are growing faster and producing more food. The forests are bigger and healthier. CO2 is good for our Earth. But Al Gore, the Democrat Party and all of the professional societies and environmental groups are frantically trying to get us to stop producing it. This is the strangest distortion of science and reasonable judgment of my life time. And there seems to be no willingness to listen to opposing views. Never-the-less, I have dedicated the remaining years of my life to try to correct this horrible distortion of science. Despite the reality, the U.S. Environmental Protection Agency has now classified CO2 as a pollutant. And the President says he is going to authorize the EPA to start taxing our carbon footprints. So even if it is not causing climate change, we are told it is evil over and over again and soon may be forced to reduce our carbon footprints by phasing out our use of fossil fuels. And now the President has committed to a National reduction of our so called “greenhouse emissions” by at least 20% within a decade. Think about what we are doing with our fossil fuel burning civilization. We are lengthening the length of life of all us humans and animals by producing more plentiful food and for we human providing a far more wholesome civilized environment with better heating and air conditioning, better medical care and all the benefits of ample power and energy. In short, CO2 is making life good. You should realize that the atmosphere of Earth is vast and amazingly self-cleansing. Earth’s atmosphere weighs about 11,700,000,000,000,000,000 pounds. So when our exhaust spews a few thousand tons of carbon dioxide into the air, it is a tiny contribution. After all these years of burning fossil fuels the carbon dioxide in the atmosphere is still less than one half of one percent. Since the air is not warming as predicted, climate alarmists recently have shifted to raising alarm about how the oceans are absorbing the CO2. They say it is making the oceans acidic. That is a gross, alarmist claim that is not validated by the data. The measurements show that the oceans are still very alkaline. The miniscule amount of CO2 being absorbed is not creating any problem except in the imaginations of some agenda driven scientists and environmentalists. Their claims about damage to the ocean sound a lot like the claims they used to make about melting polar ice and dying polar bears. The alarmists say that “science has spoken” and “the debate is over” and “the issue is settled”. Global Climate Change, a NASA website, reports 97% of climate scientists agree that warming trends over the past century are very likely due to human activities. That 97% figure has been widely used by various climate alarmists and widely reported in the media. But an examination of the process through which that figure was calculated makes it clear it is not a valid statistic, only a manufactured number. And, remember that most scientists are under great money pressure to support the global warming/climate change alarmist position. Their income and professional standing is totally dependent on it. 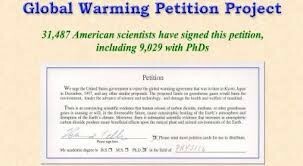 So it would be no surprise if 97% of their research papers support climate change. So the climate change alarmists dismiss those of us who are skeptics as “wackos” and “deniers”. This is very insulting, and not just to me, because I am not alone; not the only climate skeptic. There are thousands of men and women who stand up to the climate change media and political barrage. Many of them are as dedicated as I am to correcting the runaway bad science about CO2 as a significant greenhouse gas. Have you ever heard of the Oregon Petition? It debunks global warming/climate change with the following words “There is no convincing evidence that human release of carbon dioxide, methane or other greenhouse gasses is causing or will, in the foreseeable future, cause catastrophic heating of the Earth’s atmosphere and disruption of the Earth’s climate. Moreover, there is substantial scientific evidence that increases in atmospheric carbon dioxide produce many beneficial effects upon the natural plant and animal environments of the Earth.” Over 9,000 scientists holding Ph.D.’s and a total of over 31,000 scientists have signed that petition. The Heartland Institute has brought climate skeptics together for Ten International Conferences on Climate Change. Great scientists from around the world gather for these occasions and present the results of their research that debunks the various aspects of the global warming. Heartland has placed videos of all those presentations on their website. I have been honored to speak at four of those conferences. What a comfort it is to meet the Ph.D. scientists from Harvard, MIT, Princeton, UCLA, the Universities Virginia, Georgia, Alabama and Washington and from great international Universities and a host of others who have developed new evidence that there is no climate change crisis. 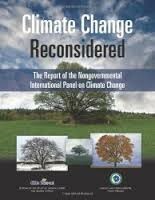 Heartland Institute has also organized a Nongovernmental Panel on Climate Change. It has collected the papers from scientists from around the world and organized them into an impressive scientific book. The contents are also posted on the internet. So you can say “science has spoken” only if you are willing to discount, toss out, ignore and disrespect the thousands of scientist and their papers and articles, blogs and speeches that debunk the global warming theory. More and more people, non-scientist citizens are understanding that there is no climate crisis. A survey by Pew Research showed that while 67 percent of Americans believed global warming is occurring and 44 percent said the earth is warming mostly because of human activity more than half of the people are not at all sure that mankind is producing climate change. But we skeptical spokespeople have to follow the media back roads of blog websites, You Tube, Facebook and Twitter, as well as conservative AM radio stations and occasional talks and speeches before community group meetings to get our story out. The mainstream media from the television networks and major stations and even most cable channels to most newspapers and magazines tend to give “the sky is falling” news releases by climate change alarmist major headline distribution but ignore the case set forth by the skeptics. As for the movement to “break the addiction to burning oil, coal and gas” be very careful. If we cut off power generation by fossil fuels at this time, it will destroy our civilization and bankrupt us all. Many people say to me, perhaps you are correct about the science but the move to green energy is good thing. Why not let the government phase out our old fashioned fossil fuel power plants, heating systems and cars and trucks. I understand how they feel and I want them to understand that I am not against developing new fuels; not at all. But they must understand we are in no position to make that dramatic move at this time. The cost of pushing us faster than the scientists can come up with practical new power systems, is already damaging out way of life and threatens to bankrupt our civilization. We have to go slowly and since we are not harming our environment with our current fossil fuel power system, we should move ahead carefully. The average American family of four is already paying an additional $1,200 a year for food, fuel and power as a result of the anti-fossil fuel initiatives. As the EPA carbon fees roll out and as coal powered electrical plants are shut down that cost per family is projected to increase to over $4.000 a year. That can be a very serious matter. For the poorer American families losing $4,000 a year would have a huge impact on their lives, healthcare for the, amount and quality of food, internet and smart phone access might be eliminated and in might cost the young people their higher education. All of this will a profound impact on the productivity of our nation. While the average person will not really understand what went wrong, everyone will suffer the consequences. As an example consider this: the development of wind and solar (green energy) is costing us about 16 billion a year in subsidies and tax incentives and that is significantly harming our economy at this time. It would be very wise to drop or at least significantly trim back those subsidies and incentives and let our economy perk up. But that doesn’t mean that fossil fuels will power our civilization forever. Remember that 90 percent of the scientist who ever lived are alive today. And many of them are probing every concept for a better way to power our civilization. 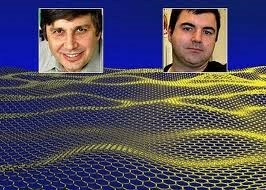 One exciting new material that won the Nobel Prize for Physics in 2010 is graphene. In about 30 years graphene solar panels will be 1,000 times more effective, and graphene batteries will be 1,000 times stronger. This means we will be able to turn off the power plants and shut down the power grid. Each home and business will easily produce all the power it needs. Graphene solar powered cars will be big, heavy and fast. Graphene systems will be used to desalinate ocean water cheaply. You may find this hard to believe, but to an older person such as myself who has watched science produce a multitude of things that were unbelievable in my youth, this is not unreasonable at all. It will happen. Please understand that my stand on the climate change issue and my confidence in science to provide solutions within a few decades, does not mean that I am not dedicated to protecting our environment. To the contrary, I regard leaving a pristine planet Earth to our children and succeeding generations as our number one responsibility. Clean air and clean water and are basic. But please understand that exhausting CO2 (invisible, odorless, tasteless, vital to life) gas into the atmosphere is in no way damaging our environment. But I do feel strongly that we have a lot to do the clean up the waters on Earth. There is no question they have been to dispose of trash and waste. And we need to encourage emerging civilizations to utilize our advanced systems for the clean burning of fossil fuels. The bottom line is simply this: Climate is changing as it always has, mostly from natural forces. Our civilization is also changing the climate but not very much and only in very minor way and only in a few localized and regional areas. We are dealing with these little climate changes in a reasonable scientific way. No crisis is occurring and there is no reason to fear any in the future. But on the whole we are doing a better and better job of protecting our Earth while living healthier, longer and far more comfortable lives. Every civilized human being now has as small advanced computer in his/her pocket or purse. Vast knowledge is at our instant access. As a result we are smarter and safer than ever. But for at least the next 30 years, fossil fuels will be required to power the system that feeds data and videos to these devises and makes amazing instant communication possible. We are now so well educated, I think everyone now understands s how absolutely essential it is to protect and improve our wonderful blue and now greener than ever before little marble, Earth. Let’s all work at that. But in the meantime, Life is good. Don’t live in fear of “climate change”. Live a life of joy and love. Despite all issues we work to solve remember please that most important thing we will ever learn is to love and be loved in return. The middle east was once entirely forest. Man cut down all the trees. It became a desert. Man makes pollution which changes the environment. Greenhouse gas is pollution. We should be planning for the future, not arguing about the past. Greenhouse gas has significant consequences for all who breath it. 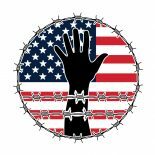 This entry was posted on April 23, 2016 by conspiracyanalyst in Climate Change, Earth News, Global Warming, US News, Weather and tagged Climate Change, Global Warming.